The first name in spy fiction, naturally, is a code name. There is no John le Carré, but there is a David Cornwell. The author of The Spy Who Came in From the Cold, The Constant Gardener, and Tinker, Tailor, Soldier, Spy is still with us at age 87 (and still writing), but two of his sons, Simon and Stephen, have taken over the family business in a way, developing le Carré projects for film and television. Their biggest hit thus far has been the Tom Hiddleston-led AMC miniseries The Night Manager, but don't sleep on the somewhat overlooked Philip Seymour Hoffman movie A Most Wanted Man. The Cornwell's new project, AMC's The Little Drummer Girl, might fill a post-Americans vacuum for double-agent sagas. A faithful adaptation to the thick text, given cinematic flair by South Korean director Park Chan-Wook (Oldboy, Stoker, The Handmaiden). This is television for smart people who are ready to put in a little work and not be spoon-fed, trusting that by the end of six hours all will make sense. "His stories are very sophisticated," Stephen Cornwell boasts in a phone interview, when I mention what an impact The Little Drummer Girl had on me when I read it in my teens. As a novice reader who mainly read Douglas Adams, I was new to the experience of enjoying a book where, for the first 250 pages, you are completely in the dark. 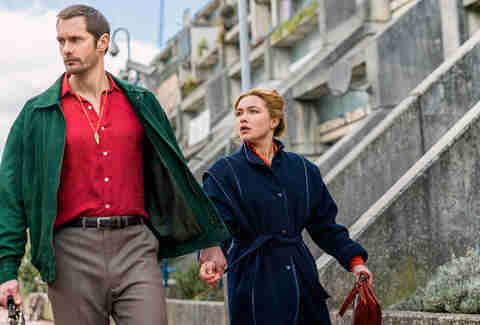 Set in 1979 (roughly when the book was written), The Little Drummer Girl was unusual for a le Carré story at the time in that it left the Cold War in the background and focused on the Israeli-Palestinian conflict, though on the European stage. The novel was also rare in that its lead character was a woman. Florence Pugh (Netflix's Malevolent and Outlaw King), whose next-big-thing buzz is more than justified, stars as Charlie, a young British theater actress who exudes an outward confidence, but is still defining herself. She is vaguely anti-Zionist, but not in a militant way; she attended some meetings because a man dragged her to it. The one place where she is self-assured is when she is playing a role. A human sponge, she calls herself, able to memorize things quickly and eager to go all-in for a characterization. This is important because she's been targeted by two Israeli Mossad agents, the crafty, mustachioed Kurtz (Michael Shannon) and brooding, exotic Becker (Alexander Skarsgård), who think she will help them entrap a secretive terrorist mastermind who just blew up an attaché's family in Germany. But wait, why would a woman sympathetic to the Palestinian cause want to help the Israelis? Because the human psyche is complex! And that's why the 1984 movie version starring Diane Keaton didn't quite work; you need a full six episodes to dig into the paradoxes of these characters. In a fascinating introduction to the 1993 reprint of the book in which he details the amount of research he did (his description of waiting to meet PLO leaders in Lebanon reads like the exploits of his lead character), le Carré commented that "in America, where no popular novel had presumed to suggest that the Palestinians were human beings with a legitimate case, it created a brief furore." Ironically enough, the book was well received in Israel. I bring this up because the show does a pretty good job of handling the nuance of what can safely be called the thorniest of all world affairs. Charlie, perhaps yearning for strict guidance in her life, is quick to do whatever her new handler Becker asks of her, even if that means falling in love with an imaginary Palestinian. The pair "design a fiction" (with Becker as stand-in) so she can use this narrative to infiltrate terrorist (or, if you like, resistance fighter) training camps. "We're not trying to be comfortable, we're trying to be true to a character and accept the consequences," Stephen Cornwell continues when I ask about diving in to some very controversial waters during a politically sensitive time. Beyond showing gray areas in the Israel-Palestine conflict, Florence Pugh's character is a potential lightning rod for impassioned interpretations. She is intended, I think, to show how women, especially four decades ago, are often led by men to do things they don't want to do. However, some Twitter-typing television audiences are quick to forget that representation does not necessarily mean authorial endorsement. "It's a show about people," Simon Cornwell responds. It's also marvelously shot by director Park Chan-Wook, and in some of Germany's remarkable brutalist structures with great period clothing and gadgets like reel-to-reel tape recorders. The "spycraft" of the era (as well as the bomb-making) is very different than today, and Park is nothing if not a fetishist for detail. "When you get into post-production with director Park, that's where you see what he had in his head the whole time," Simon tells me. "Normally a director arrives on a location and they think, ‘Okay, where should we put the camera?' but he comes in very precise and says 'This is here, this is here, we need this shot' and like a sculptural process it magically comes together in post-production." "On day one," Stephen continues, "there is a scene with a staircase, and many directors would shoot walking up a staircase in a simple way and move on. But he shoots it in a complex, spiral way that, of course, mirrors the emotional spiral of the characters at that moment." 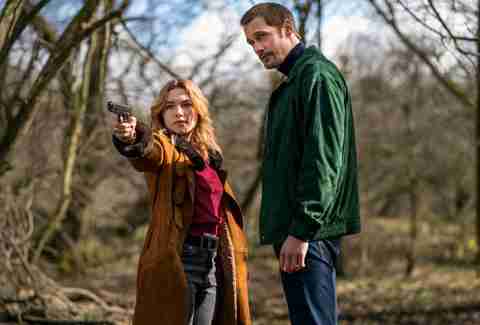 This kind of master plan that reveals itself at the end is quite in keeping with The Little Drummer Girl and le Carré in general, but the sons burst my bubble a little bit. Sadly, they have no funny stories of hanging out with their dad in hotel lobbies as a kid, with him making up stories about travelers as they walked by. Even worse, he never taught them how to play chess. "You read his books and you assume he's a grandmaster," Simon laughs, "but far from it. I don't think he has the patience to play chess." "He'd prefer to be writing," Stephen adds, which, I suppose, is better for us. The Little Drummer Girl debuts on AMC on November 19. Jordan Hoffman is a contributor to Thrillist.